The strong, the brave and the formidable make history. It is absolutely true about Maharana Pratap Singh of Udaipur. His life is an eternal tale of bravery, determination and uprightness in the Rajput history of Rajasthan. He was a diehard patriot, high-minded leader, staunch warrior, caring king and worshiper of freedom. He was the only Rajput ruler to have fought with Akbar and defied his massive army. Like a dutiful son, he protected his kingdom Mewar and the subjects with all his might from the Mughal forces. Today, Indian Eagle pays tribute to Maharana Pratap on the occasion of his birthday. 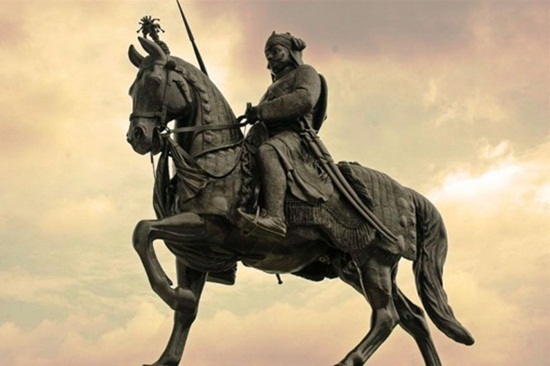 In 1540, Maharana Pratap was born in Kumbhalgarh Fort, about 85kms away from the City of Udaipur. Built by and named after Maharana Kumbha, the fort on a 3,500 feet high hilltop is surrounded by 13 peaks of the Aravalli mountain range. The 36km long wall fencing around Kumbhalgarh Fort is the second largest in the world. The forest on the rough landscape around the fort has been converted into a wildlife sanctuary, named after the fort. Click The Great Wall of India to know more about Kumbhalgarh Fort and its place in the history of Udaipur. The history of Chittorgarh is incomplete without a mention of Maharana Pratap. Chittorgarh will never forget the lifelong battle that this bravest Rajput had waged to win back the fort of Chittorgarh from Akbar, the Mughal Emperor. Chittorgarh was the capital of Mewar Kingdom and the seat of Rajput royalty when Maharana Udai Singh II was in power. It was the glory and pride of Mewar which Maharana Pratap restored from the possession by the then Mughal Emperor. The Chittorgarh Fort, the largest in India, dates back to the 7th century. There are four magnificent palaces, nineteen temples and historic monuments inside the fort. An integral part of the Udaipur history, Gogunda is a small town which was Maharana Udai Singh II’s hideout Akbar seized the Chittorgarh Fort. The town was almost inaccessible because of its precarious location on a hilltop, which made it a safe shelter for the Maharana. The town witnessed the death of Maharana Udai Singh II and the coronation of Pratap Singh in 1572. Gogunda was made the temporary capital of Mewar when Pratap Singh was titled Maharana. It is Gogunda where Maharana Pratap counseled and prepared his army for the historic Battle of Haldighati. The famous Battle of Haldighati in 1576 between the massive Mughal army led by Akbar, and the soldiers of Maharana Pratap was the hardest time in the fate of Udaipur. It was the culmination of the hostility between the Emperor and Maharana. Though Maharana’s 22,000 soldiers were outnumbered by the strength of the Mughal army of 2, 00,000 soldiers, they fought fiercely till the end and caused causalities to the enemy. Maharana Pratap was always concerned about the security of his subjects. That is why he shifted the capital to Kumbhalgarh in the Aravalli Range to save them from consequences of the battle. Then, he brought all Rajput chieftains under one roof for the sake of Mewar’s glory and independence and built a force of tribal people by training them in warfare. Maharana remained indomitable and out of Akbar’s grasp even after 6 months of the fight. Maharana Pratap was not just a brave warrior, caring king and valiant leader but also a man of principles. He never tried any unjust means nor transgressed from the rules of warfare to win over his enemies. Raja Man Singh of Jaipur was the Mughal army general in Akbar’s times. One Maharana got to know Raja Man Singh’s whereabouts in a jungle. He could have easily attacked Raja Man Singh when the latter was busy hunting, but he did not backstab the latter. His distinction of being just was a rare leadership trait. When Rahim Khan-e-Khana, a Mughal army officer, was campaigning against Mewar, Maharana Pratap’s son Amar Singh caught hold of Rahim’s women and brought them to the capital. When Maharana came to know about the captivity of the women, he detested such a mean act by his son and commanded him to set them free. Maharana’s generosity touched Rahim and prevented him from campaigning against him. Maharana Pratap’s life is a lesson on how to stand ground against all odds. When he was wandering in forests to keep away from the Mughal army after the Battle of Haldighati, his family suffered many hardships. His wives and children had to starve and spend sleepless nights under unfavorable circumstances in forests. Such a catastrophe forced him to think of surrendering to Akbar and signing a treaty of peace with the latter. He discarded such thoughts and gathered courage to tide over the waves of misfortune and face Akbar once again. This piece of reminiscence is just a single page of the history of Mewar, Udaipur, Rajputs and Rajasthan. Booking cheap flights to India is a round-the-year opportunity to visit Rajasthan and turn over other pages of the Rajput history whenever you wish. The The cheapest air tickets to India are guaranteed at Indian Eagle!